Recently I completed the The Three Day Refresh, a cleanse designed by Beachbody to help get one’s nutrition on track. This particular cleanse is sustainable for me in that it allows solid food (whole fruits, veggies, and good fats). The program came with dinner recipes and suggested a cup of warm broth to accompany dinner. That eventually became the highlight of the cleanse for me, and my favorite new habit that learned while on the cleanse. As I prepped my meals for the three days, I made some homemade veggie broth to accompany dinner as suggested by the plan. I made my usual “leftover end” chicken stock but added some extra veggies and left out the chicken bones. I use a meal planning website, No More To Go, where I get my weekly variety of healthy whole meal recipes. These recipes often make use of chicken broth, so I like to keep some on hand in the freezer for any given meal so I don’t need to buy the jar, box, or condensed stuff. I never thought to use broth as my dinner drink. I think this will now become my usual dinner drink… INSTEAD OF WINE. It was THAT good. Here’s what I put in mine this week but really, any veggies you have around will work great. — carrots: I buy those carrots with the green ends so I throw those ends in the pot (but cut off the part where the greens attach to the carrot since there is always lots of dirt in there and I’m not sure I can get it all out). I also threw veggie peels from the carrots i prepped for the week and a couple of whole carrots. — scallions: I cut off the delicious greens for dinners this week and threw the white ends with the fuzzy roots in the pot. —celery: throw in all the droopy white pieces from the middle of the stalk, all leafy ends and also the very bottom of the nice looking stalks (where it started getting wide and white). The rest are cut up to snack on later in the week! — seasoning: about two bay leaves, 10-15 whole peppercorns and some salt; I’m not too into salt like some if my family and friends. Since I usually make broth for cooking, I go light on the salt and season with it as I cook. Since this was for drinking straight up, I added some salt but went easy on it (since was for a cleanse) and tasted it later to make sure it didn’t need more (it didn’t). Put all that stuff in a large pot, cover with water and bring to a boil. Then, turn down to a simmer for a few hours. This part is tricky. If the simmer is too aggressive you might boil away too much liquid and need to add more water. I tend to watch it and keep it at a very low simmer but let it reduce a little to get extra concentrated and flavorful. Just today, a friend passed me an article by Dr Sears about the benefits of “bone broth.” While the term bone broth sounds somewhat gross to me (although bone marrow is a whole other story…mmmm), I had no idea about the boost your immunity, benefits to your gut, reduction of inflammation that bone broth provides. And of course, another positive is that it is now hip in New York City for those very reasons. In the past, I always prepared chicken broth using my left over chicken bones from rotisserie chickens that I may have used for other meal prep. After the deliciousness of veggie broth I considered switching to veggies without bones for awhile. Now that I understand the specific benefits related to the bones in the broth, I think I’ll continue with my warm drink at dinner but with bones and not plan veggie. To convert the above veggie stock to “bone stock,” throw the bones from two rotisserie chicken to add a add nice subtle flavor — if you want more “punch” you could add some cheap chicken parts (necks or legs). I like to roast them first, as I find that the roasted chicken adds a really nice flavor. Oh, and peel off the skins! It adds a layer of fat to the top of your broth that you either need to skim off the entire time you cook, or once in the fridge for a day, it’s a thick layer of fat on the top of the broth that you can just pick off with a spoon. I go with no slim and generally have very minimal fat in my broth. I also learned that adding a couple of tablespoons of vinegar not only enhances the flavor, it helps the minerals more easily leech the valuable minerals from the bones to the stock. I’m excited to try some new broth ideas! What are your favorite broth recipes or tips? When I was little, I knew where my mom hid the Christmas presents and would unwrap them just enough to see what they were. I still enjoyed receiving and opening them even if not surprised by what they were on Christmas morning. When there is a new Les Mills Body Pump or Body Combat release coming out, I always check out the reviews, playlist and Google any songs I don’t know well in advance of release date. Most of the time I’ve never heard any of the songs so this research doesn’t really serve me well, yet I continue to do it four times a year. My monthly stitch fix ritual makes complete sense to me given this history. Each month I get an email from stitch fix that says “Linda, your fix has shipped!” Each month, I immediately go to the stitch fix website and pretend to check out so I can see what the five items are in my fix. I usually Google them to see images of what’s in store for me. I would say a lot of the time the images I find online don’t impress me as much as the actual pieces when they arrive in the mail. I’m more of a solids gal, so generally the patterns scare me a little when I see them online. But so far, I would estimate that 80% of the time I’ve really enjoyed even the patterns once I got them in person. In some cases, it may have been subtle nuances of the pattern (last month had a mixed media sweater with a pattern in a sheer fabric across the front). What I couldn’t see online was the pale pink in the pattern that was stunning when paired with my blush colored skinny jeans. There was an orange shift dress with a steel grey chevron pattern. I assumed this would be way too busy for me to ever consider keeping. Once I tried it on, the soft fabric and beautiful three quarter bell sleeves plus a belt to break it up a little made this dress a keeper. Yet, month after month I log in, “check out” my soon to arrive fix, and am not overjoyed by the items on their way… only to be pleasantly surprised when they arrive. Wait, did I just say I enjoy the surprise? Or could it be that exceeding my original expectations is pleasing to me? So here I am anxiously awaiting the Christmas morningish experience of opening my fix when it arrives. I have previewed my five items and am not excited about any of them. Which means that I will likely love four of the five if my 80-20 rules plays out as it has historically. I asked my stylist specifically for a Moto jacket this fix. This Moto was on the way, but wasn’t quite what a I picturing in my head. A little frumpy maybe? Well, I guess I’ll have to wait and see up close and in person. As I wrote this post a few different ideas flowed through my head trying to analyze my stated distaste for surprises. I obviously like the element of the pleasant surprise. Is it a need for instant gratification? I don’t think so since I like knowing what is coming but don’t need to have it that moment. Could it be that I truly enjoy the anticipation? Let’s go with that… I’m anxiously anticipating my November fix! So it came and three of the five were keepers. The two returns were the Moto jacket: the sleeves were made for someone with giraffe arms and was just too baggy in some parts and too lose in others. Plus it was pleather, in a really bad way. Other return was a quite pretty sheer top with a back pleat. The pattern was mauve (strike one) that looked sort of like lace but wasn’t (strike two on lace and lace -looking pattern), the fit was so strange- it was huge in the top (neckline and sleeves) actually perfect on the hips. I am a bit pear shaped but you would have to be pretty broad and well endowed on top to fit properly. The keepers were awesome. I asked specifically for some fun casual wear for my trip to DC over Thanksgiving. I got exactly that! A pair of black high-waisted textured skinny pants that fit perfectly. A nice foundation piece with a little flair in the texture. A cute crew neck sweater with skinny stripes of autumn colors. And a blackish brown, soft thin weave infinity scarf. This last piece was one that I wasn’t excited about during anticipation station You don’t get much more boring than an infinity scarf in a basic neutral color. But this was gorgeous and perfect weight for fall. So we hit 3/5 on this fix… Not quite my 80% rule but close enough for me! How about you? Do you cheat and peek at your fixes before they arrive? At work, I strongly believe in using data to validate hypotheses, measure success, and provide foundation for future assumptions. I’m not sure why it took so long for me to recognize that principle and use good data and/or evidence to measure success with my fitness goals. All those years, I had it wrong. I relied on the scale no realizing that the scale is a terrible measurement tool. I love weight watchers and lost a lot of weight on it – so I’m not knocking the principle that you need to regularly check in against your goals with DATA, but I am knocking the method of measurement that the scale provides. On weight watchers, there were weeks where I didn’t eat breakfast or keep up with my usual water intake – for the sake of wanting a “good weigh in.” A good friend turned me on to “smooth move” tea, which helped me, um, clear things out before weigh in. I recognize these are ridiculous little rituals, sort of like football players who don’t shave for the season or change their underwear. Seeing results on the scale is what would motivate me to keep “at it” so in doing these little things to see results helped to keep me motivated. Back in my weight watchers days, I wasn’t really working out much so the scale was a decent measurement tool at the time because I wasn’t building muscle anyway. When I started doing body pump and power yoga, I started running into problems with my measurement tool. I was weighing myself weekly but the scale wasn’t budging. I was frustrated that despite the healthy eating and three times a week workouts the scale wasn’t moving down… and sometimes even moved up! This derailed my progress because I felt like I was doing as much as I could — at that time — and not seeing results. Eventually, Jillian, my body pump coach, invited me to participate in a 21 day fitness group just before Thanksgiving in 2013. I had been working out consistently for about 11 months at that point but the results I wanted to see were not happening (i.e. the scale wasn’t moving). I thought the challenge group would help me fine tune whatever it was that was preventing me form losing weight. I really wish I took “before” pictures as Jillian encouraged at the start of the group. But I was afraid to see my body – to really see it. By January 2014 as I began my third challenge group, I was so proud of my progress, I took a pictures. I wasn’t a huge fan of how I looked but I was a huge fan of my progress. I took just one and didn’t share it with anyone. By August 2014, at the end of Jillian’s summer challenge group (and my 6th challenge group as a participant) – I posed while my mom took my pictures. She had the January picture up on the computer to make sure I duplicated the pose. She kept looking back and forth between me and the picture. I thought my pose was different and she was going to have me correct my stance. Instead, she said “Your belly! It’s not touching your arm! !” We were pretty excited and did a bunch of poses (of course I needed to show off my shoulders – I don’t think I’ve ever had muscles in my shoulders like this!) I would never had recognized the progress that i made on my back and shoulders had it not been for taking pictures because I don’t typically have the view of my body at that angle. Interestingly, at that point I was still only down about 9 pounds but the difference was incredible in the pictures. not only is a pound of muscle smaller than a pound of fat, but your body burns more fat (as opposed to muscle and fat) while at rest for up to 48 hours after a strength training workout. Needless to say, I’m a strong believer in the picture as a measurement tool/data point for progress. I think a weekly (or say tri-weekly, like at the beginning and end of a 21 day challenge group 😉 picture will help you really look and analyze areas that you need to make changes, perhaps in your ab muscles, your inner thighs, or that little bit of flab between your arm and your chest. The scale doesn’t show you those things, and not only that, it punishes you for getting stronger!! I saw lots of progress on my back and shoulders but needed to see more results in my abs. So, I started doing more core work (and especially focusing on my core during body combat) and that extra bit of focus led to great results next time I took a picture. Try and have someone else take the pictures for you, if you can. Remember – these measurements and pictures are for you and you only – sometimes we don’t see a change in the numbers, but our bodies change for the better! You don’t have to show anyone, but maybe you’ll want to once you have a hot new body to show off! If you’re standing up against a solid background (and use the same solid background for your after pic), you’ll be able to focus on YOU and not whatever else is in the pic. Wear swimwear or tight fitting workout wear. This is the best way to see the changes that have happened in your body! Show as much of your body as is comfortable. Also wear something you don’t hate. I hate the shorts I’m wearing in my first set of before pics but I continue to wear them across all my pictures for consistency. Take the photos from many angles. A front view, side view, back view and at a twist. You can put your hands at your sides, on your hips, even flexing in the air! Just make sure that you have before/after photos in the same pose so you can accurately see your transformation! I wish I took a before picture, and when I finally did take one, I wish I took a few more angles. I tried to get in and out as fast as I can but now I have nothing to document the transition in my back and shoulders! You may be wondering why if I’m seeing so much progress I’m not posting my pictures here…. I will, in time, but for now they are are for me and me alone. Before I made an active decision to be fit for life, being out and about, busy, short on time, out with the kids, or at home with the kids would be an excuse to make poor decisions that would take me off plan. Going off plan didn’t usually mean for that one unhealthy decision though, it would mean being off plan for the rest of that day, weekend or week. Staying fit in my kitchen and out of it meant that I needed to “think fit” for every meal, snack and situation. This meant being prepared with emergency snacks that would not only be there for me when I needed them but also satisfied whatever temptation I may face ahead of me during the emergency. The requirements of these ESs would be to be yummy enough that I would actually want to eat it over, say, a bag of chips at the soccer field, but not so good that I am able to keep it around and not be so excited about it that I binge out when not really hungry. Also, they would obvi need to be healthy and contain some protein to sustain the fullness. Ideally these snacks are portable (can handle being tossed around in my purse for a few hours while on the go) and would be under 200 calories. I thought about the specific times that I would need these emergency snacks: at work when feeling rushed between meetings or stressed out; at night before dinner while prepping the kids’ dinners; weekend mornings before and during the kids activities; at night between dinner and bed. So the work snacks were easy. We have a fridge and a microwave so my options were pretty flexible. I needed to make myself a promise that I would only eat the food I brought to the office. The snack drawer, chocolate dish, and baked good brought into the beverage area were off limits. Next I needed to be prepared with healthy filling snacks to make sure my appetite was satisfied all day. For morning, between breakfast and lunch, I usually bring two mini omelets. It’s a nice kick of protein to sustain me through my lunchtime workout and has a breakfasty feel to it, since I love breakfast foods but usually only have time for (and depend on) my morning shakeology. Afternoons are usually a fruit (whatever is in season: apples, melons, berries) and usually a piece of light string cheese, mini baby bel, etc). I know myself well enough to know that I need the cheese pre-portioned and pre-packaged so I’m not tempted to taste while portioning myself or to over do it on the portions. I also know that I look forward to my fruit. I’ve been ambitious and tried to do veggies and hummus but I ultimately don’t want veggies for my snack. If I want to look forward to it, it needs to be fruit and cheese. Then there are those times at work when I just need to get up from my desk, stretch out and clear my mind. In the past I would stop at the chocolate drawer (yes, we actually have a chocolate drawer!!) as I walked around and cleared my brain. I wasn’t typically hungry, I was either stressed, frustrated or just needed to stretch. So now, if it’s not snack time and that feeling is coming over me, I get some green tea. It always works to satisfy my fake hunger and tide me over to my next meal or snack. It also gives me the opportunity to get up from my desk for a few minutes. I try to eat my afternoon snack around 4:30, so when I get home at 6ish I’m not starving while getting the kids’ dinner ready. If I’m feeling hungry I usually am not actually hungry but tempted by their food. So, first thing I do when I get home i pour myself delicious herbal water. Then if I recognize that I really am hungry I will have a few nuts or share an apple with the kids with a touch of peanut butter. I usually don’t need this though because I’m not actually hungry, I’m still satisfied from my protein rich afternoon snack! After dinner but before bed, again, I’m usually not hungry. My body just wants wine or dessert. I solve this with some herbal tea (sleepy time vanilla or tazo calm) in my fancy tea kettle and cup. Next, I sorted out my weekends. I typically find myself rushing around between kid activities and play dates then am suddenly HANGRY! I solve this by making sure I have lunch before leaving house. If I’m really strapped for time, I’ll have shakeology for lunch because I can take it on the go. Then, I always always always have a couple of bars in my bag (kind or chia) and if I’ll be out for awhile I bring some portable fruit like an apple. I always have my water bottle with me (and sometimes infused water if i think I’ll be tempted with other drinks like lemonade or starbucks while out and about). An added benefit (not intentional) was in my wallet… Not spending money at the cafe by my son’s soccer field, I’m bringing my own food and saving money and my waistline. As as I wrote this post, I was introduced to a super fun snack delivery service called Graze — think of it as stitch fix for fit snackers. Use my code (7KQVJ6RFE) at graze.com/us to get your first box of tasty and inspired snacks for free! I’ll post a review once I receive my first box! 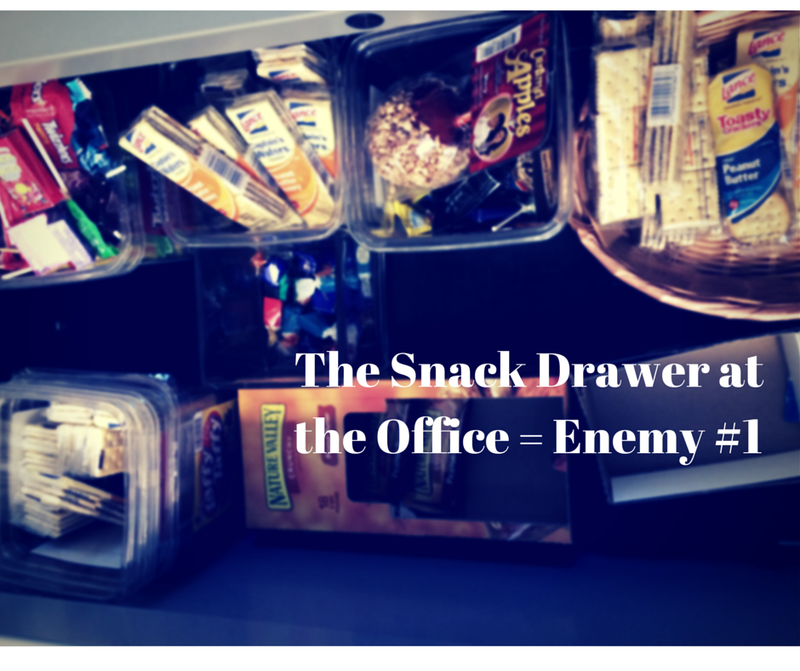 Time to share … What’s your go-to emergency snack?